Cruising conjures visions of languidly flip-flopping up to some teak-swathed covered pool deck to enjoy a margarita and a good book under the Caribbean sun. But , while there certainly are opportunities for downtime, depending on the cruise, you may have to look harder to find them. On a brilliantly sunny day at sea, for example, you might meander out to the pool only to find it overrun with fellow sun-worshippers, all fighting over the same few dozen deck chairs. Throngs of splashing, laughing children will have taken over the pools and the hot tubs, and the sound of the waves will have been drowned out by an outdoor movie’s soundtrack, the resident reggae band or a raucous belly-flop contest. But, if you try just a little harder, peace is still possible to find. You can rent a private cabana for a few hours, or claim a lounger in an adults-only section of the deck. You can retreat to the spa or to the pool on a sunny shore day, when everyone else is exploring off the ship. The bottom line? Cruising can be equal parts amped-up and low-key, sociable and solitary. What you personally experience may depend on where you are on the ship at a certain time of day, which ship or cruise line you’ve chosen, the itinerary and how much extra you’re willing to budget for your vacation. Inside cabins. Don’t book a windowless, cheerless, 150-square-foot stateroom cabin if your idea of relaxation means spending time alone or as a couple, away from cruising’s stereotypically chummy, social scene. Living in cramped quarters only forces you out more into the ship’s hustle and bustle. World cruises or “Grand Voyages.” If you’ve the soul of a hermit crab, these lengthy voyages aren’t for you; they attract affable crowds of repeat cruisers and promote social bonding amongst crew and passengers. In other words, you’ll be drawn out of your shell, regardless of how much you long to stay in there. Theme cruises. These full or partial charters essentially take over a ship or a substantial number of cabins. Nearly everything revolves around the theme, and the experience is all about connecting like-minded folks socially in big-group activities. School holidays. The minute school’s out, mainstream cruise ships tend to fill with children—especially on itineraries of less than seven days. That isn’t a problem if you’re cruising as a family. Choose Disney Cruise Line for the littlest ones or Royal Caribbean for tweens and teens, as both have ideal setups to whisk your brood off to play and out of your hair. But if you’re booking a “grown-up” cruise, you’ll find a more relaxing atmosphere on posh lines like Regent Seven Seas, Paul Gauguin Cruises, Seabourn Cruise Line, or river lines like Uniworld. Looking for a more budget-oriented getaway? Stick to the mainstream lines when school is in session. Book a sanctuary. Big balcony suites make for an idyllic retreat, with extra living space inside and a private verandah—no fighting over chairs!—outside. When the crowds on deck or in public areas become overwhelming, you can seek solace in your cabin. Even standard balconies work well for this—so long as the balcony is truly private. (It shouldn’t afford a view of you to passengers on decks above.) And since balcony cabins are an increasingly standard feature on newer ships, you may be able to upgrade affordably, especially if you book during a balcony or upgrade sale. Live at the spa. Spa suites and cabins, a recent trend on cruise ships, allow passengers to create their own spa-themed experiences onboard with accommodations near the spa, V.I.P. spa privileges and soothing in-cabin amenities like spa showers and yoga mats. However, perks vary widely from line to line. Residents in AquaClass cabins on some Celebrity Cruises ships get unlimited access to the spa’s Persian Garden aromatherapy steam room and Relaxation Room, as well as access to their own specialty, healthy-eating restaurant called Blu. Costa Cruises passengers booked in Samsara Spa cabins or suites receive two spa treatments, two fitness classes, unlimited use of the thalassotherapy pool, and a reserved table in the Samsara restaurant. Other lines with spa accommodations include Carnival Cruise Lines, Holland America and NCL. Spend your way to quiet times. Classed cruising is making a comeback, so you can spend more money to maximize privacy and R&R. Book a Courtyard Villa on an NCL ship to enjoy spacious accommodations and a luxe ship-within-a-ship experience. Onboard Norwegian Epic, for example, villa residents have exclusive access to their own pool and sundeck, gym, dining and nightclub facilities. On Cunard ships, Queen’s Grill passengers have their own dining rooms, sun decks, and lounge areas, not to mention fabulous accommodations—including two-floor luxury duplexes on Queen Mary 2—and butler service. Book a kid-friendly cabin. If you’re traveling with the family, minimize your stress by booking a cabin designed with families in mind. Disney cabins come with a split bathroom design (a toilet and sink on one side, a shower/tub and sink on the other), allowing you to maximize the efficiency of kids’ daily bath-and-bedtime routines—and consequently maximize pleasurable downtime for you. Family cabins on lines like Royal Caribbean, Princess Cruises, and Celebrity offer separate bedrooms for kids, or at least partitions between the pullout sofas and the master bed, so parents can stay up with the light on while the little ones are tucked in their beds. Pay attention to location. Cabins on some ships don’t shut out ambient noise entirely, so if you want a blissfully quiet in-cabin experience, make sure the laundry room, elevators, or other noisy public facilities aren’t within earshot. (That includes above or below your cabin.) Waking up early due to loud conversations in the laundry room across the hall or being kept awake due to the thumping disco overhead does not make for a relaxing getaway. Free yourself for dinner. Allowing guests to choose when to eat and with whom is becoming the rule—not the exception—in cruising, and it’s great for those who prefer intimate meals to the exchange of pleasantries at an assigned table. Lines like NCL, Regent Seven Seas and Silversea Cruises are always open-seating, while lines like Princess and Holland America let passengers choose between open seating in one dining room or set seating in another. Just know that on the larger ships, you might have to wait for a table for two at peak times. Consider the alternative. Large and small ships these days are offering bistro-style “alternative” restaurants, where you’ll need to book ahead and (in many cases) pay extra for a more intimate dining experience. However, you can easily make reservations for a table for two and avoid forced socialization with other passengers. Options run the gamut from upscale (Carnival’s steakhouses) and quirky (Celebrity’s Qsine), to exotic (Holland America’s Tamarind), theatrical (NCL’s Cirque Dreams and Dinner), and casual (Royal Caribbean’s Johnny Rockets). Eat off-peak. Even with flexible dining, a full dining room can mean the only choice you’re offered is whether to share a table for eight or ten. Plan to arrive for dinner once the rush is over or before it’s begun to maximize your chances of snagging a quieter table for two. Eat ashore. For a truly authentic meal in a foreign clime, port days await. Lunch ashore is always a possibility, since you typically won’t need to hoof it back to the ship until around 5 or 7 p.m. Ocean-going lines like Star Clippers and SeaDream, as well as most river cruises, may stay ashore well into the evening or overnight, affording plenty of time for relaxing dinners. Not only will you not have to sit with people you don’t know, but you may not even be able to understand the non-English conversations at the tables next to yours. Cruise intensively. A port-intensive itinerary means you’ll be off the ship for much of the cruise, exploring the world meaningfully on your own at your own pace—and avoiding idle chatter with fellow passengers whenever it suits. Windstar Cruises and Oceania Cruises are two lines that keep sea days to a minimum and emphasize time in port. Look for itineraries with overnights in port to further maximize your time ashore. Or, look for sea days. Alternately, if all you want to do on vacation is lounge around, listen to music, read books, watch movies, and simply enjoy not having to be anywhere specific at any time, you might prefer an itinerary with lots of sea days. With nowhere to go but the open sea, you’ll find your stress melting away and that rush-rush workday mentality evaporating into the ocean air. With food available onboard 24 hours a day and the sun deck open all day long, you might even consider throwing out your daily schedule of onboard events and just letting each day happen as it will. Choose the route less traveled. Boutique, expedition, and small-ship lines have a distinct advantage over mainstream mega-ships: they fit into smaller, lesser-known ports and can deliver blissfully crowd-free shore days. On its coastal route, Hurtigruten’s shore-hugging ships visit 34 ports over six or seven days to deliver people, goods and mail along the Norwegian coast, giving you an opportunity to explore non-touristy ports. Or, choose a cruise to Antarctica or off-the-beaten-path Alaska on an expedition line like Lindblad Expeditions or American Safari Cruises, where the biggest crowds in “port” may consist of seabirds, penguins or seals. To avoid the tourist hoards in the Caribbean or Europe, look to SeaDream Yacht Club or Star Clippers to slip into little coves and harbors—or enjoy blissful days of water play from the ships’ water sports marina. Play the numbers game. Ships can theoretically sail above 100 percent occupancy because that percentage is based on the traditional assumption of two passengers per cabin—when in fact cabins may hold three or four people, or more. 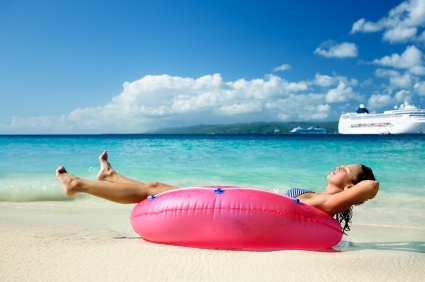 To guarantee you don’t end up on an overly full cruise, avoid peak-season cruises, especially during school holidays. Try Alaska in May or September, the Caribbean in the fall, or Europe in the late winter or early spring. Alternately, try a less-popular type of cruise. For example, repositioning cruises—so named because the ships are switching from one cruising region to another —take place in the off-peak months of spring or fall and tend to be long, transoceanic journeys or oddball itineraries. Because of this unusual style and timing, these cruises are often cheaper and less crowded. Go it alone. Explore ports of call independently or, if you have the means, hire a private car, with or without a private tour guide to show you around town. You’ll have more flexibility compared to a ship-organized tour, and it can be less exhausting because you can sightsee as you please, avoiding shopping stops or attractions that aren’t of interest and avoiding long waits while the tour guide leading a large group struggles to round up wayward stragglers. Escape private island crowds. Cruise line private islands offer pristine beaches, plenty of water sports, and lunches that don’t cost extra. But with everyone in the same small space, it can be no more relaxing than being on the ship’s sun deck. To escape, rent a private cabana where you can have some space to yourself and perhaps splurge on an al fresco massage. Plus, having a place to shower, change, and store your stuff will keep your island visit hassle-free. Stay onboard. Avoid irritating lineups for tenders, aggressive touts, and jam-packed beaches and souvenir shops by remaining on the ship when it anchors in a popular port. You can breeze through the buffet at lunchtime, and spa treatments are easy to come by (and often discounted). And remember that perfectly positioned deck chair by the pool you’ve eyed all cruise long? Now’s the time to nab it. Go against the traffic flow. Every ship has a daily rhythm that influences the movement of people onboard and creates opportunities to find seclusion in certain rooms or decks at specific times. To avoid the crowds, hit the gym at lunchtime, rather than in the early morning; log in to the Internet cafe while everyone’s at dinner instead of mid-afternoon on a sea day; and snag a chair in the top-of-ship observation lounge in the morning, as opposed to at sunset. On sunny days, indoor conference spaces, card rooms and libraries tend to be under-used. Dine at off-peak hours to avoid lines in the buffet. Walk (or sit) the promenade. Even party ships harbor quiet places to tune out the rest of the world. The outside strolling area known as the promenade is a great place to start on any ship. It’s far from the pool-deck action, isn’t a connect point between major public rooms and often comes with deck furniture for reading or napping. Some promenade decks wrap around the entire ship and are great for walking. For example, on Disney ships and Royal Caribbean’s Oasis of the Seas, the promenade decks double as jogging tracks with incredible views—try them instead of a busy gym. Let the experts direct you. Concierges, private butlers or the guest services desk know their ships’ quiet nooks. If you’re looking for an out-of-the-way retreat, ask these staffers for suggestions. Their insider tips can help you find the ideal chill-out location. Zone out in an adult-only enclave. More and more ships these days are discreetly separating under-18’s from their parents in order to maximize peaceful coexistence of all concerned. The Sanctuary on Princess ships, The Retreat on P&O Cruises’ vessels and Carnival’s Serenity deck areas are places to grab drinks and sun loungers for blissfully kid-free afternoons. You won’t be able to get away entirely from fellow frazzled parents—these spots do tend to fill up—but you can certainly avoid chit-chat by donning earphones and listening to MP3’s or simply closing your eyes. Or, if you really want to close the curtains on the outside world, rent a private cabana on Oceania or Holland America and wile away the day, lounging in solitude—with perhaps a visit every now and then from an attendant bringing fruit skewers and refreshing drinks. b>Relax around the clock. Night owls have the run of the ship while everyone else is asleep. Turn insomnia to your advantage, and read a book in an empty lounge or library, enjoy a midnight snack at the buffet, or gaze at the stars out on deck. It’s amazing how alone you can feel on a 3,000-person vessel!